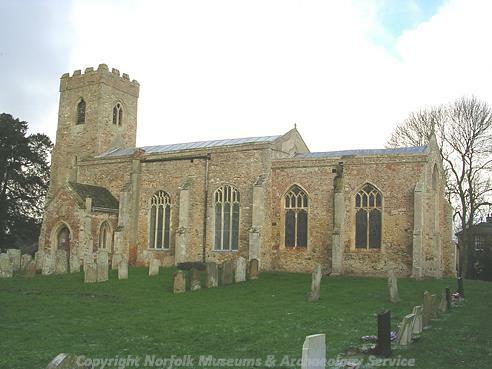 The siltland parish of Clenchwarton is situated in the north western part of Norfolk, immediately west of King’s Lynn. The meaning of its name is a little obscure, but is probably from the Old English for ‘ Enclosure of the people of Clenc’. Until the early 19th century, it was one of the most isolated parts of the region, standing on a peninsular with the river Ouse on two sides, salt marshes to the north and linked directly to upland Norfolk only by ferry. Little is known of Clenchwarton before the Norman Conquest, and this lack of early human activity may reflect the originally marshy landscape of the area. There are no finds or other evidence of activity until the Iron Age, and that period is represented by the single find of a harness fitting (NHER 29136). Likewise, there is no evidence of Roman activity, and Saxon finds are limited to a few pottery fragments (NHER 20880, 21384, 23051 and 23053), and one or two low mounds that may indicate salt production (NHER 27943 and 27946). The medieval period following the Norman Conquest generally saw an expansion in population and activity in Norfolk, but perhaps because of its marginal geography, Clenchwarton does not seem to have grown as rapidly as other areas, the main medieval settlement being confined to the central village. The Domesday Book of 1086 mentions the parish, but unusually the entry deals only with land ownership, with no mention of population or productive resources. However, as the land was progressively drained and sea defence banks built (e.g. NHER 21807 and 21808), settlement became more viable. Certainly a large number of medieval pottery fragments has been found (examples include NHER 2188, 5533, 20322 and 22151), and there is evidence of a medieval port and settlement at Maidenhouse (NHER 2192). Probably the oldest surviving building in the parish is St Margaret’s Church (NHER 2193). This attractive church, built of carrstone, brick and flint, consists of a 14th century west tower, a 15th century nave and south porch (though the porch was restored in 1861), and a chancel of 1864. Inside, there is a 17th century pulpit, and a marble monument to the Forster family, dated 1742. In the churchyard is the base of a 14th century limestone cross, with part of its shaft still in place (NHER 2191). Another medieval cross is marked on 19th century maps, but has since vanished (NHER 3293). The only other medieval building to survive is Porch Farmhouse (NHER 12385), which has the date 1436 marked on a wooden beam. Another medieval church, that of South Clenchwarton (NHER 2235), has not survived, being destroyed by flooding in 1368. Nothing remains of the church today, but large quantities of window lead and some fragments of limestone have been found in the area. Also in 1907, two medieval stone coffins were found in a brick vault close by. Individual medieval finds in the parish include a brooch, a buckle, a book clasp, a seal matrix (NHER 29136) and a cannonball (NHER 17301). The only post medieval building on the record at present is a toll house (NHER 17879). There was a windmill in the parish (NHER 16348), marked on a map of 1826, but this was demolished in 1870, and nothing remains today. In recent years, the remains of wooden jetties or quays have been noted (e.g. NHER 41393, 41395, 41396 and 41797). The whole of East Anglia was fortified in World War Two to face the possibility of German invasion, and Clenchwarton still has a remaining souvenir of those times in the form of two concrete tank blocks and an anti tank rail (NHER 32379). There was also a concrete pillbox (NHER 38247), but this had been destroyed by 1961. The paucity of the early archaeological record may, as mentioned, be due to the inhospitably marshy nature of the land before drainage, and its liability to flooding even afterwards. However, it may also be that there is more evidence of human activity from those times that simply has not yet been found. Piet Aldridge (NLA), 7 December 2005.